Upgrade to stainless steel flap? Food Ingredient Bin - RM15TR. The RM15TR food ingredient bin has a volume capacity of 65 litres and a weight capacity of 30kg. 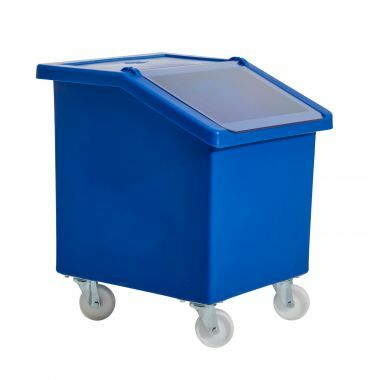 The RM15TR is a plastic, mobile, ingredient bin that is supplied as standard with a plastic drop-on lid and a clear plastic flap, which can be upgraded to a stainless steel flap if required. 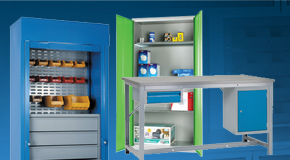 The product was originally designed for the storage of food ingredients such as flour in bulk, yet, it also provides an effective solution for under-table or low level storage and materials handling applications. The RM15TR is manufactured from food grade polyethylene and is supplied as standard with 4 x 4 inch (100mm) swivel castors with polypropylene wheels. The crevice-free, one-piece, moulded construction ensures that it is seamless, watertight and easy to clean. The RM15TR can be produced in a wide range of colours to assist with colour coding including blue, red, yellow, green, white/natural, orange, purple, brown, black, light green, dark yellow and pink. 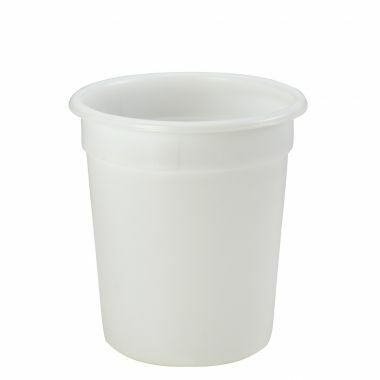 A hard-wearing, strong, hygienically designed, food grade, plastic, ingredient bin equipped with lid and plastic flap. 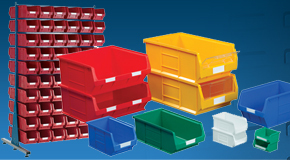 Consisting of a single one-piece moulding the food ingredient bin is watertight, seamless and easy to clean. 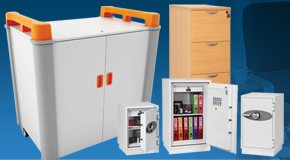 Perfect for under table storage of dry food stuffs and ingredients such as flour. 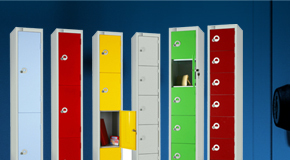 Available in wide range of colours and with stainless steel flap upgrade. 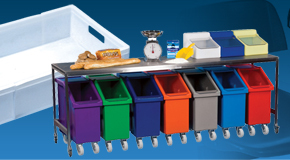 Fitted with four robust 4” castors these mobile flip-top bins are commonly used within the food industry for the storage and dispense of ingredients. The ingredients dispenser consists of a 65 litre capacity mobile tank with a plastic lid and clear hinged flap. The container and lid are produced using a certified food grade polyethylene plastic which has ideal hygiene properties for their intended application. 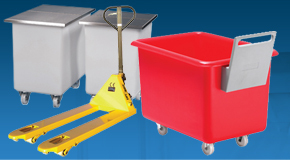 The mobile flip-top bin proves to be long lasting, providing years of service as well as being easy to clean and maintain. 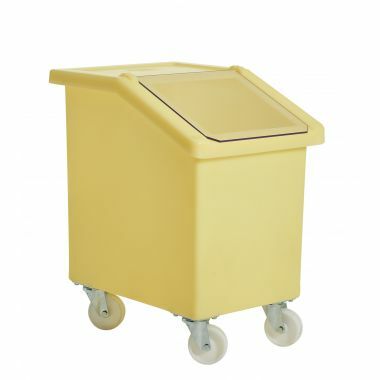 Being mobile, the mobile flip-top bin is able to be wheeled under work surfaces easily to save on storage space. Its clear hinged flap allows for quick and efficient access which proves ideal when used on a busy and demanding production line. 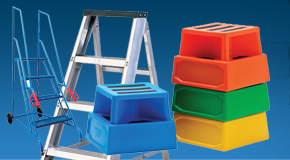 These mobile flip-top bins are also available in a range of sizes and colours, as well as static table top versions. The colours that are available as standard are often associated with food hygiene regulations. 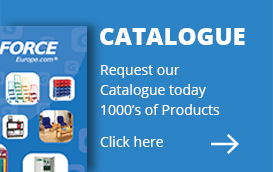 Why buy Food Ingredient Bin – 65 Litre? 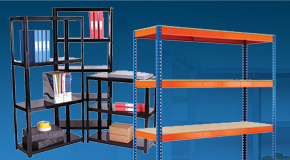 Easily stored – These mobile flip-top bins are be easily wheeled out of the way and stored under workstations to save on space as well as clear walkways. Perfect for industrial use – The food grade plastic that these ingredients dispensers are produced from is both strong and durable, helping to provide a product that will withstand the test of everyday use. 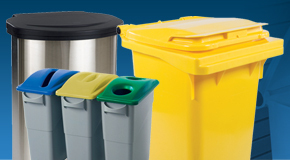 Multi-purpose – Commonly used for the storage of ingredients these mobile flip-top bins are well suited to a number of different general storage applications, offering an easy access mobile storage container.